Cardi B and rival, Nicki Minaj are at each other's throats again ... with Cardi threatening to beat the hell out of Nicki and pursue legal action. 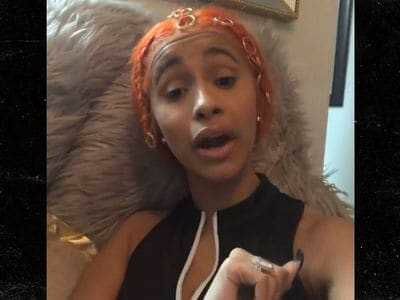 Cardi was heated Monday as she ripped into Nicki during an expletive-filled tirade on social media, challenging her rival to a fight after Nicki went on her Queen Radio show and spilled more details about their infamous NYFW fight. CB called Nicki a snitch for claiming Rah Ali beat up Cardi during last month's brawl ... adding she's tired of the back and forth, so they should settle it with their fists. We broke the story ...Cardi attacked Nickilast month at a party during NYFW, throwing a shoe at her rival and missing before walking away with a huge knot above her eye, which Nicki now claims came from Rah. Nicki is offering $100k to anyone who's willing to leak footage of the altercation, and said she's willing to take CB to court ... but Cardi is firing back and saying she should sue Nicki for defamation.